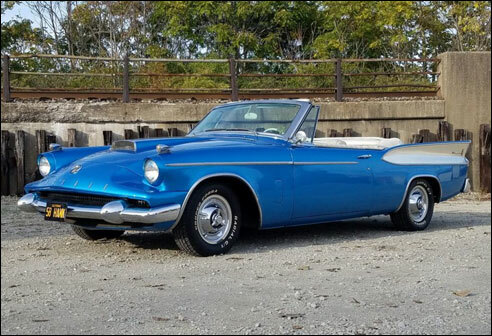 EDIT: Although the above was a one-off customized version of the 1958 Packard Hawk, there were 4 official models produced by Studebaker-Packard in 1958. 1958 saw the Packard line expanded to four models; a 4-door sedan, a 2-door hardtop (sometimes referred to as the “Starlight”, a name used by Studebaker), a 4-door station wagon and the Packard Hawk, a modification of Studebaker’s Golden Hawk with a “fishmouth” Packard grille. Only 2,034 of the three standard models (sedan, hardtop and station wagon) were produced; an additional 588 Packard Hawks were built as well. The rarest of all ’58 Packards is the station wagon, with only 159 produced. The last Packard rolled off the South Bend assembly line on July 13, 1958.